Our Bratwurst is a mild German sausage. Ingredients include: pork, farm fresh eggs, milk and a blend of mellow spices. 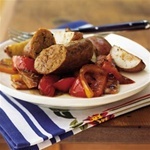 This sausage is delicious served hot off the grill or in a sandwich with sauerkraut and onions. Many of our customers say they enjoy our bratwurst as a breakfast sausage. Premium ground turkey and the same special blend of spices are used to create this healthy sausage. You'll find our turkey sausage provides protein without the fat and cholesterol of other commercial sausage. Use it in all of your favorite recipes or eat it hot off the grill. Be assured Furnari Italian sausage is premium sausage at its best! This family recipe has been passed down for generations. A special blend of fresh herbs and Italian spices compliment this aromatic and flavorful sausage that the whole family will enjoy. Our Italian sausage can be ordered spicy if you prefer a bolder taste. Used in spaghetti sauce, your favorite lasagna recipe, grilled or just scrambled with eggs for breakfast, Furnari Italian Sausage will be your new crowd pleaser! If you desire a south of the border flavor, then this is the sausage for you. Our neighbors in East Los Angeles shared their old family recipe with us. We have cooked it up for decades. With this Chorizo you’ll agree… you taste the goods not the grease! Fresh basil & garlic grown locally and superior quality Romano cheese & pine nuts are only a few of the seasonal ingredients used in this standout pesto recipe. You will never be satisfied with any other, after allowing this pesto to kiss your taste buds! Locally grown tomatoes and herbs are the secret ingredients in Furnari Garden Fresh Marinara. Our sauce is made just the way Nonna's mamma in Sicily taught her to make it. Daughters and daughter-in-laws know the family sauce secret; we do not dare alter the recipe even generations later. You can dazzle your family by using our marinara in your favorite Italian dishes.